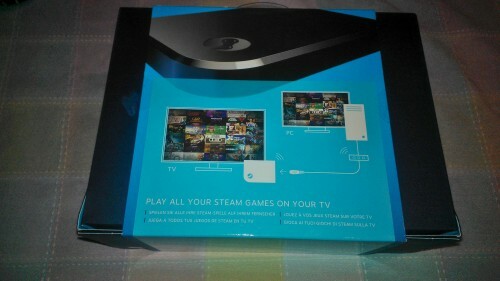 The Steam Link has finally been released, after many delays, along with the Steam Machine to usher in a new era of PC gaming. 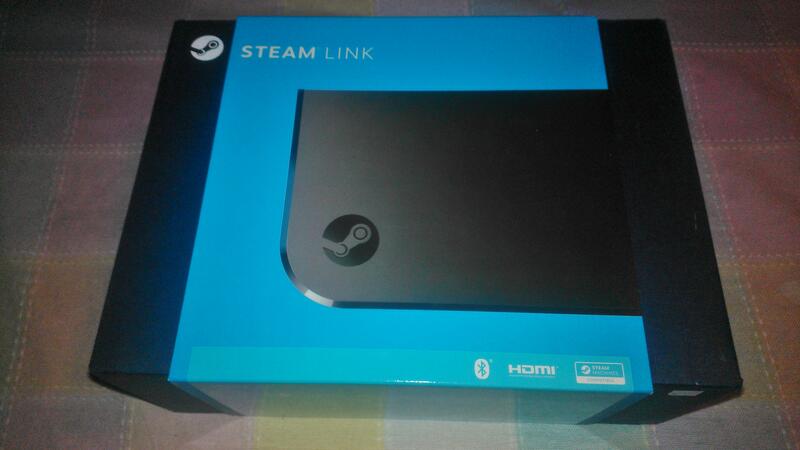 The Steam Link was actually released a couple months ago in limited quantity to those that pre-ordered it. I didn’t purchase mine until it was available to the general public on November 10th, however. 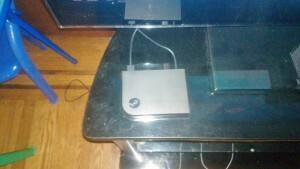 The Steam Link is an affordable streaming device that allows you to plug into any HDTV or monitor and play your favorite PC games in Big Picture mode. I opted to skip out on purchasing the Steam Controller, since Steam Link is compatible with the Xbox 360 wired and wireless controllers. I’ll give a review on how well the device works after some unboxing photos. Here is the front cover of the box for the Steam Link. Nice relaxing blue slip cover over a darker blue box. Here’s the back of the box. The slip cover shows a small diagram of how the stream is suppose to work. 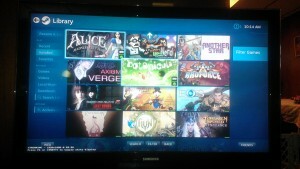 The phrase, “Play all your steam games on your TV,” is a very misleading tagline which I will talk about in a moment. 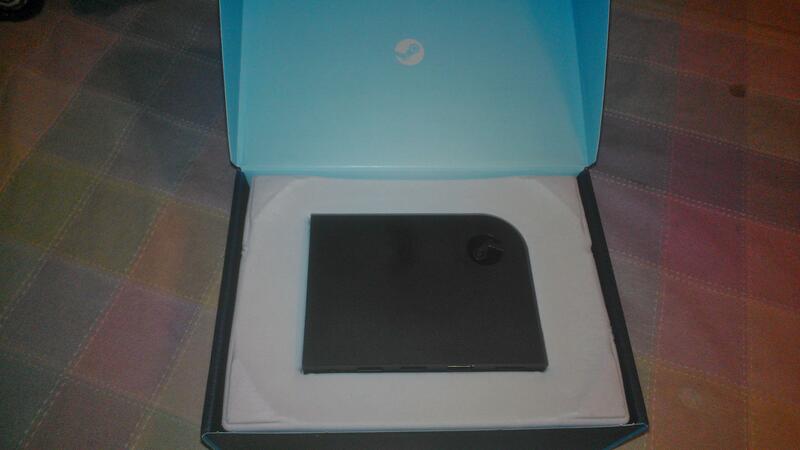 Take off the slip cover and the box flips open, showing the small device. 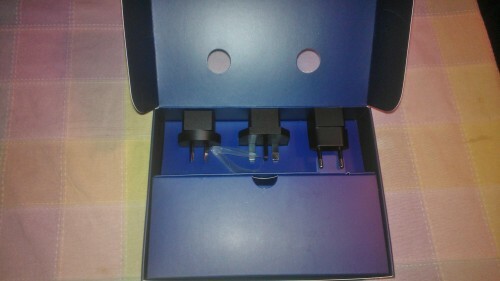 After picking up the device and the cover, it reveals three outlet adapters for various regions. 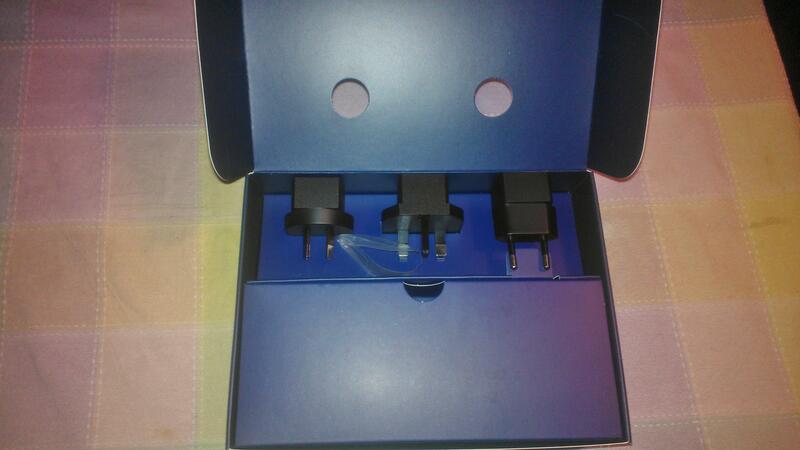 Under that big blue cover is the HDMI cable and the standard North American outlet adapter. When I said small, I really mean it. Here’s a size compassion to the Nintendo Wii U gamepad. 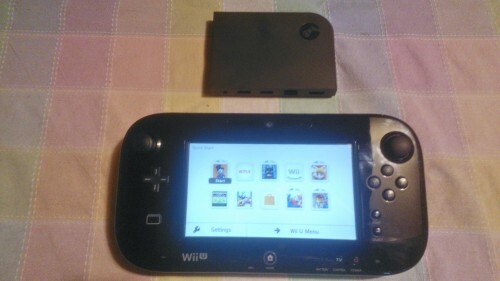 The Steam Link is barely the size of the screen of the gamepad. Here’s a more comparable shot. 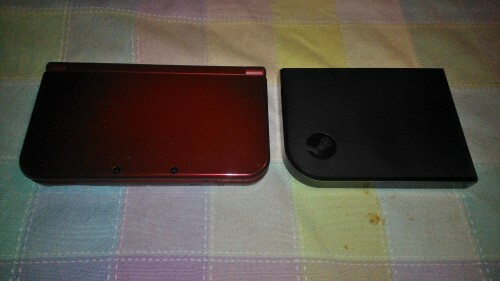 The Steam Link is sitting next to my New 3DSXL. It’s almost three quarters the size of the handheld. Setting up the device is incredibly simple and easy to do. Once plugged into your HDTV or Monitor of choice, the system will boot up and give you a language selection. After that, it will scan for networks to connect to, run an update check and apply them right away. After the initial reset, you will be brought to the start-up menu, where you can set certain options like Bluetooth connections, streaming resolutions and quality, and checking for updates. 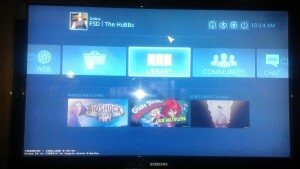 There will also be an icon that represents the PC your Steam Link is connected to. 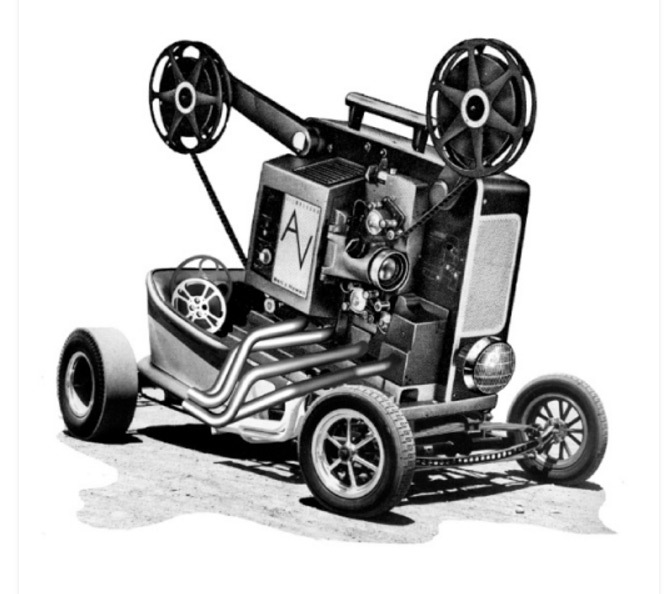 Upon selecting that, it will instantly boot up Big Picture mode on your PC and start streaming it. 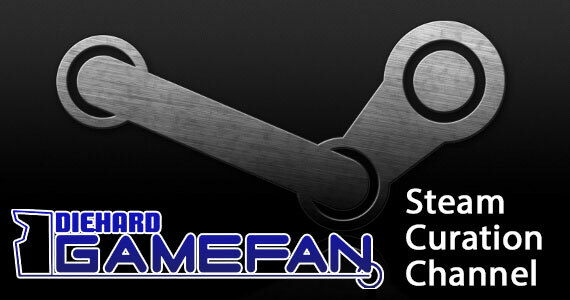 You can access the store, your library of games, the steam community, friends list and even surf the web. The first thing I wanted to test out was how well the system can use a wireless mouse and keyboard. I used the Microsoft 800 wireless mouse and keyboard combo for this review. After plugging in the USB adapter, the mouse and keyboard were recognized quickly and worked perfectly fine. Using the mouse and keybaord makes its so much easier to navigate certain parts in Big Picture mode, like the Community area, talking to friends and even surfing the internet. Playing games with the mouse and keyboard works almost like you were playing at your PC. Point and Click Adventure games like Botanicula and Primordia are responsive and play with ease. Other action heavy games like Torchlight 2 and Quake Live play perfectly fine as well, with the mouse and keyboard responding without any detectable delay. I also tested out a few MMORPG’s, but the results were very mixed. Tera and Star Trek Online played fine, with no issues arising whatsoever. 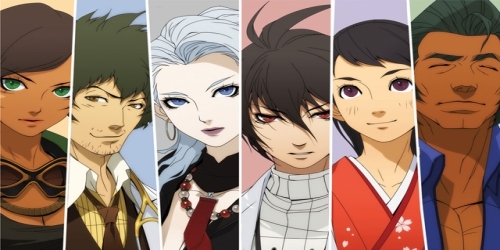 Unfortunately, some games like Echo of Soul and Forsaken are unplayable because of unknown reasons. I am unable to use the mouse to start either games from the startup screen; I can attempt to click on the Start button forever and nothing happens. I had to go to the computer and click all the buttons to get in the game, and when playing, I am still unable to play with the mouse and keyboard connected to the Steam Link. Plugging in the Xbox 360 controller works exactly the same as it does on your PC. You can easily navigate the Big Picture menu just fine and play almost any game that doesn’t require a mouse and keyboard. There are pretty major issues that I came across with certain games using the Xbox 360 controller, though. 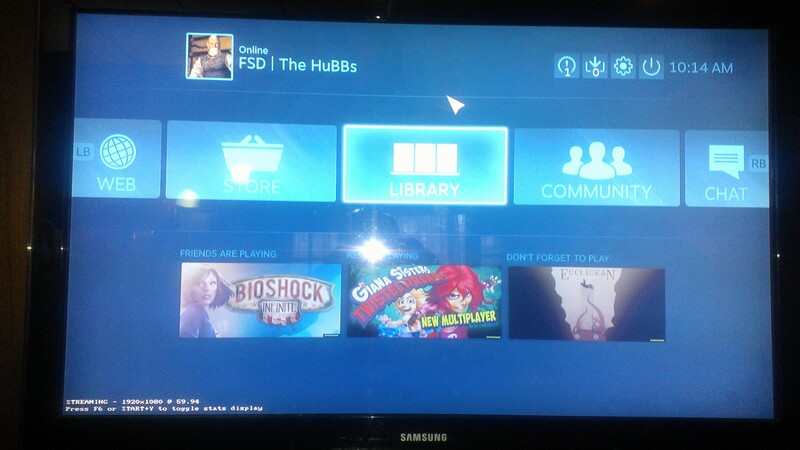 In a few games, mostly fighters, I have found that Steam Link misreads the button layout of the controller. In Dead Or Alive 5: Last Round, the game thinks the Back and Start buttons are the left and right triggers, and I am unable to fix the configuration. In Ultra Street Fighter 4, I attempted to reconfigure the buttons, only to have them not work properly. 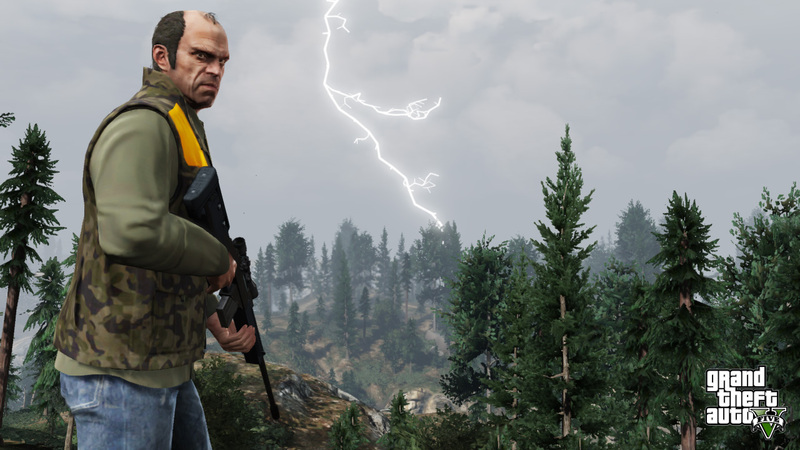 Moving the hard punch to the left trigger suddenly made it the taunt button. Move hard punch to the left bumper made it the red focus cancel. Another issue I encountered was trying to load Giana Sisters. Upon booting the game up, it hits me when an error screen telling me it doesn’t recognize the controller and wants me to reconfigure. The more annoying problem is this happens every time I boot the game up. I do not experience any of these issue when I play directly on the PC. The majority of the games that can use the Xbox 360 controller work fine, however, and it only seems to be a small percentage of games that have issues. Out of the 26 games I’ve tested, only 4 had controller or keyboard and mouse issues, so it’s not really something you should panic about. My final issue is that Steam Link only supports the Xbox One and 360 controllers. This is a major bummer, especially since I prefer to use my USB Sega Saturn pad or MadCatz arcade stick to play fighting games. It would be nice to see more controller support in the future with patches, but to be forced to use either the Steam Controller or the Xbox one and 360 controllers is a bummer for the time being. 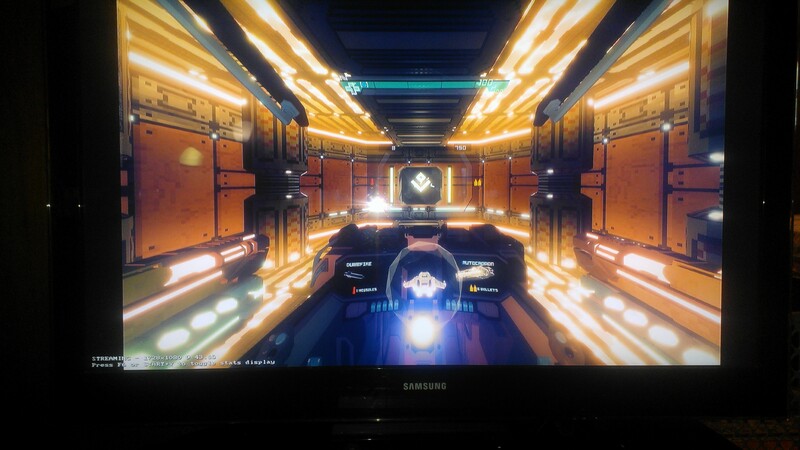 The streaming ability of the Steam Link is actually pretty impressive. Back at the main menu, you can adjust the quality of the stream with the basic options of fast, balanced or beautiful. I streamed wirelessly the whole time from two different locations in my home. The first location was the living room, with the Steam Link connected to the main TV. The wireless connection is pretty standard, since it was at least 25 feet from my router. I altered the quality to see if there was any improvement and I swapped back and between various graphic intensive games. I played some Resident Evil Revelations and it ran surprisingly smooth. I tested several other games with the streaming functions, and all games ran surprisingly well with next to no frame drops or stuttering. The next location I tried was my bedroom, which is a significant distance away from the router, and I did notice some significant frame rate drops. I changed the picture quality to Fast and this helped with the dropped frames. The only minor issue was the minor pixelation in the picture quality, which goes practically unnoticed the majority of the time. Aside from picture quality, the input delay is nonexistent. In multiple games which require precise button presses, down to the exact frame, I felt no delays. This is very important for twitch reactive games like Super Meatboy, Ultra Street Fighter 4, Broforce, Giana Sisters and other various platformers and fighting games. Using the mouse and keyboard is also just as responsive. This means a lot, especially if I am attempting to dodge attacks in Tera or Quake Live. I detected no missed input presses or delayed reactions whatsoever. Overall, the Steam Link is an impressive little device that does a pretty good job of streaming your Steam collection to any TV in your house. The quality of the stream is adjustable and still looks good no matter where you are playing your games. The frame rate maintains itself very well on a wireless connection with no detectable stuttering whatsoever. The Xbox 360 controller, mouse and keyboard respond very well, with no detectable input delays. Having a wireless mouse and keyboard is highly recommended to keep the number of cables down to a minimum. The issues I had with the Xbox 360 Controller, while problematic, were only with a few games. It is also disheartening that we are restricted to using either the Steam Controller, Xbox 360 or Xbox One game pads, but hopefully this will be fixed in the future. The big positive, though, is the price. The Steam Link goes for $50 and takes up next to no space. Compare that to purchasing a Steam Machine, which starts at around $599 and up, and still takes up some space despite being a micro PC. It wouldn’t hurt to own a Steam Link so you can play comfortably on your couch, especially if you play the majority of your games on the PC. By default or do you have to download some of the custom controller config files in options menu? I just bought a PS4 controller. Unfortunately the same input issues apply with the Steam Link for some games. Works fine on the PC. Has similar issues like the L3 and R3 are seen as the start back buttons. The triggers aren’t recognized at all.